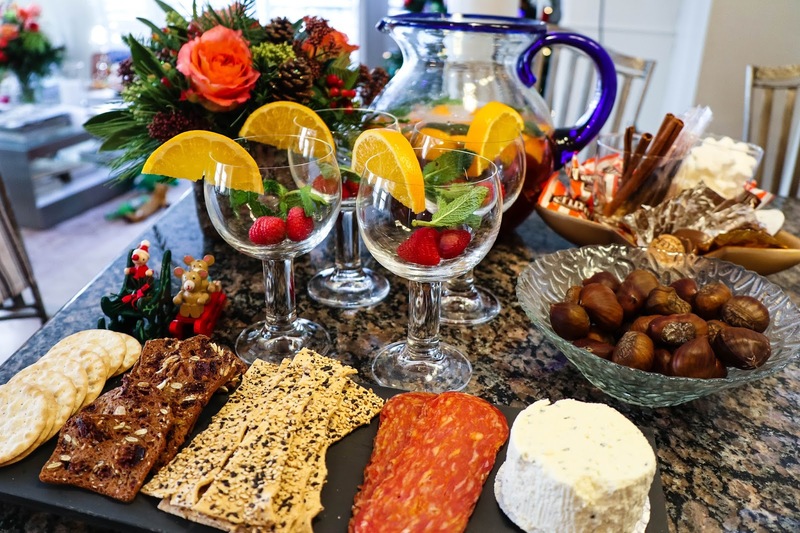 The holidays are here and that means it's time to eat, drink, and repeat. 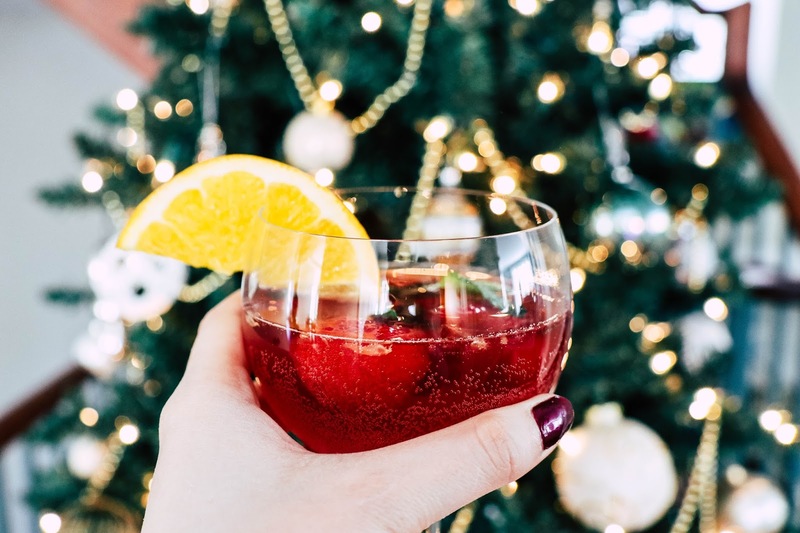 I'm a sucker for a good sangria, so this year, a pitcher of sparkling pomegranate sangria was my contribution to our Christmas Day meal. It was a HUGE hit (even my grandfather who barely drinks had three glasses), so I figured I'd share the recipe on here! 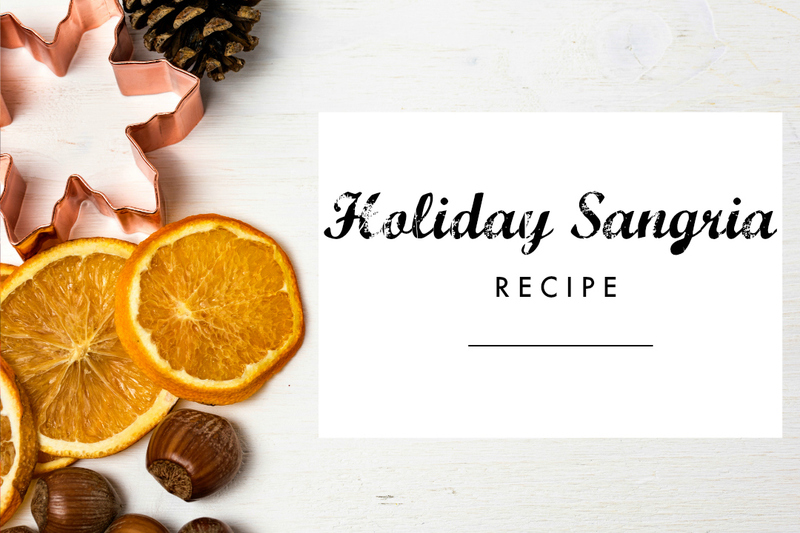 Even though I made this for Christmas, it's perfect for any winter gatherings, holiday parties, or cozy nights in. A Pitcher to Mix & Serve In! Even though it's a white wine sangria, the pomegranate juice gives it the perfect holiday red colour! This recipe is super simple to make, and easily takes less than 10 minutes, especially if you opt to use orange juice instead of juicing one yourself. It also tastes good no matter the quality/price of wine and liqueur you're using, making substitutions easy. Personally, I love this recipe because it doesn't taste overly sweet or just like juice (as I find a lot of sangria recipes do nowadays), but it doesn't have an overpowering wine flavour either. It's truly the perfect blend. Start by washing and preparing your mint leaves, raspberries and oranges. 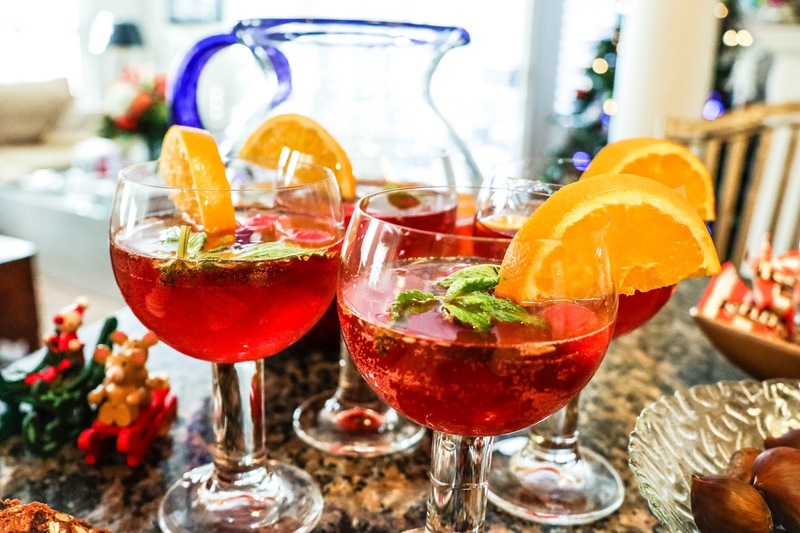 I put about 2 sliced oranges, 15 mint leaves, and half a pack of raspberries into the pitcher to give the sangria more flavour, and then used some in glasses for garnishing. This is also the best time to juice one orange for the recipe before you start mixing! 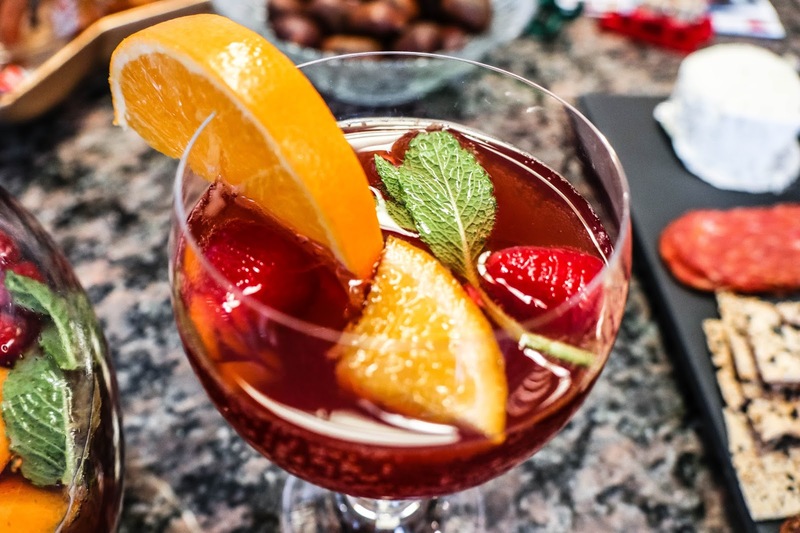 In the pitcher, mix your semi-sweet wine, Grand Marnier (or other orange-flavoured liqueur), pomegranate juice, and orange juice. Then, put the pitcher into the fridge and let it chill, allowing the fruit and mint leaves to add more flavour. But, if you've already chilled both wines and the juices, and are in a rush, it can be served immediately as well! 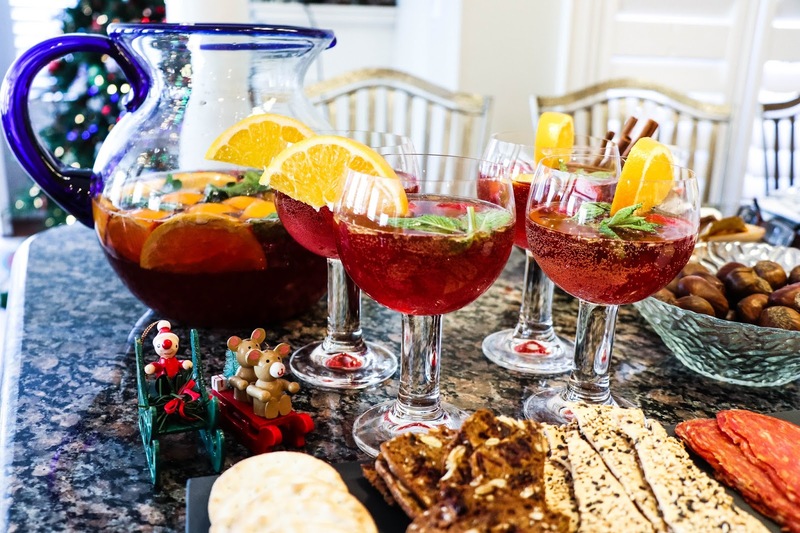 No matter which option you choose, it's best to mix in the sparkling wine when you're ready to serve the sangria, so it doesn't get flat! Place some ice cubes into the pitcher, or the glasses (depending on the aesthetic you're going for, if any), and serve! For reference, this recipe should serve 8-10 depending on what type of glass you're using.